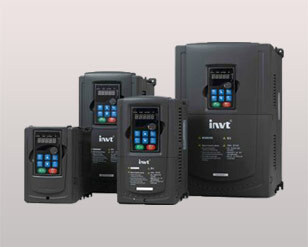 Goodrive 300 is a high-performance vector control inverter developed by invt, and it is applicable to asynchronous motor and synchronous motor for speed control. It adopts 32-digit DSP and advanced vector control algorithm to achieve high performance and high precision in motor drive control. This inverter features high reliability, strong adaptability to working environment, human-oriented function, flexible application and stable performance. 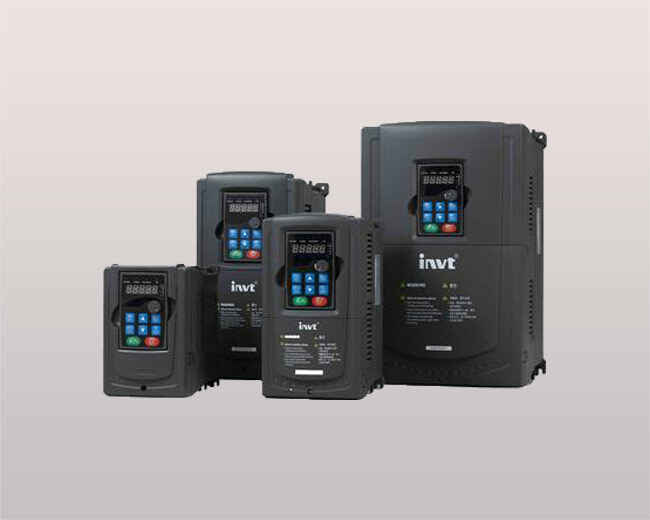 This inverter is applicable to both asynchronous motor and synchronous motor; therefore, it helps users to decrease the inventory since there is no problem of incompatibility for different types of motors. Goodrive 300 has a compact structure, independent air duct, high power density and low requirements on installation environment. The independent air duct enhances the protection effect, so that Goodrive 300 can be used in various hostile working environments. Besides, the two installation methods, i.e. board mounting and flange mounting meets the demand of different users. Two sets of motor parameters, V/F separate control, virtual terminal function, rotational speed tracking, relay delay output; Two sets of motor parameters allow users to use one inverter for different motors and help users to save cost; V/F separate control meets the demand of variable-frequency power source and achieves the flexible V/F curves. 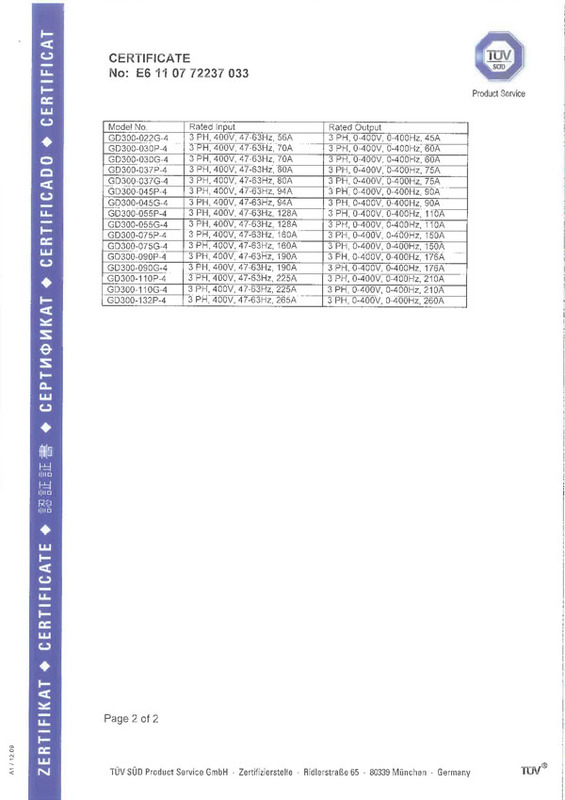 Goodrive 300 obtains CE certification and has multiple protection functions and high reliability. Goodrive 300 adopts thermal simulation technique; therefore, it has good heat dissipation effect and maintains high reliability. Goodrive 300 is built-in C3 EMI filter to eliminate interference from outside and enhance system compatibility. Goodrive 300 series passes various tests in terms of high temperature, low temperature, low pressure and vibration, which ensures high reliability before delivery. 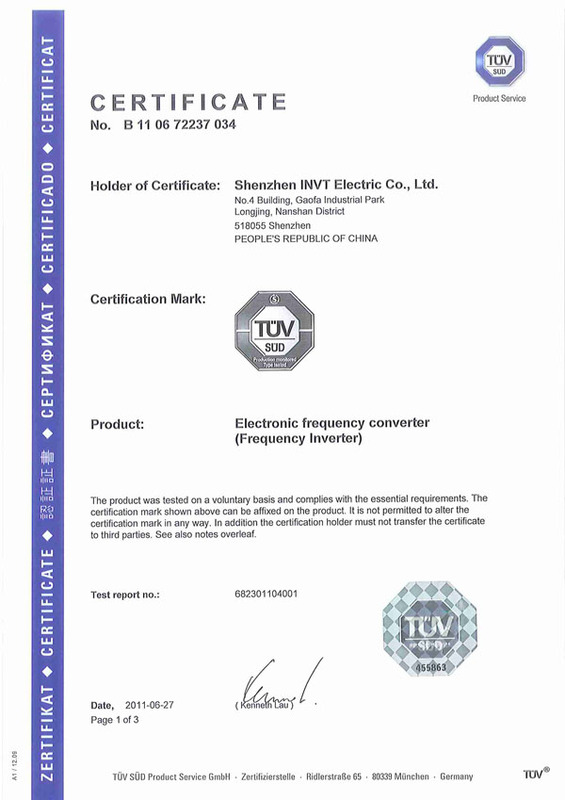 Goodrive 300 series has got TUV-SUD certification, and has TUV mark and CE certification mark. 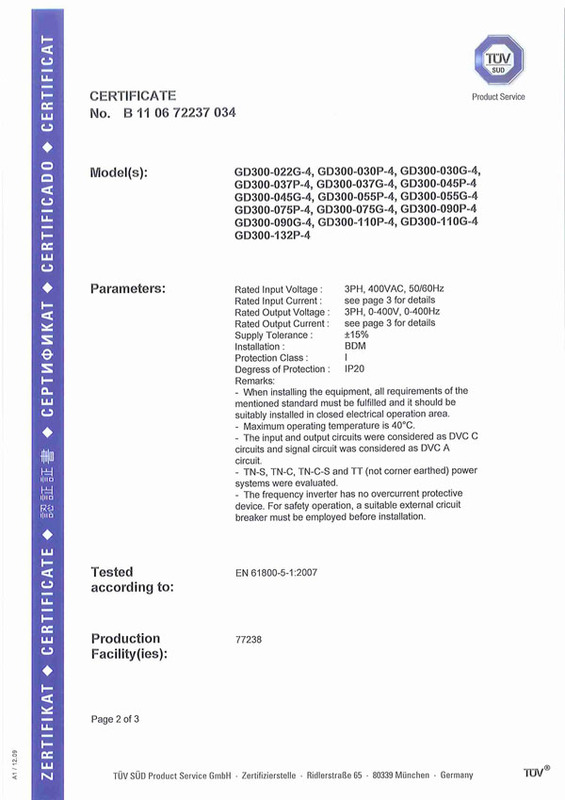 It reaches the highest technical standards in Europe. 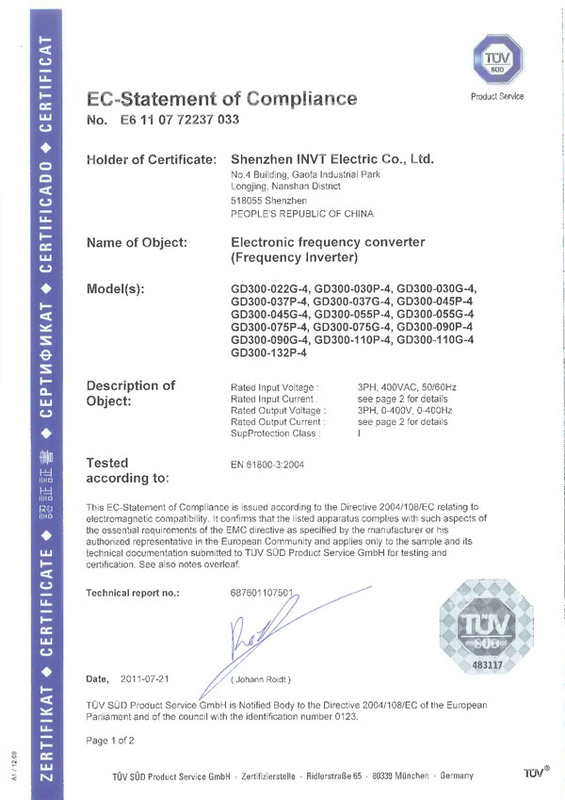 High-quality hardware: wide input voltage range, support DC input, DC bus, built-in braking unit (below 30KW), external high-performance LED keyboard, a great quantity of I/O terminals, C3 EMI filter, etc. Goodrive 300 series supports common DC bus. Goodrive 300 series supports independent control power supply to facilitate debugging by users. Support multiway analog input from -10V~10V. 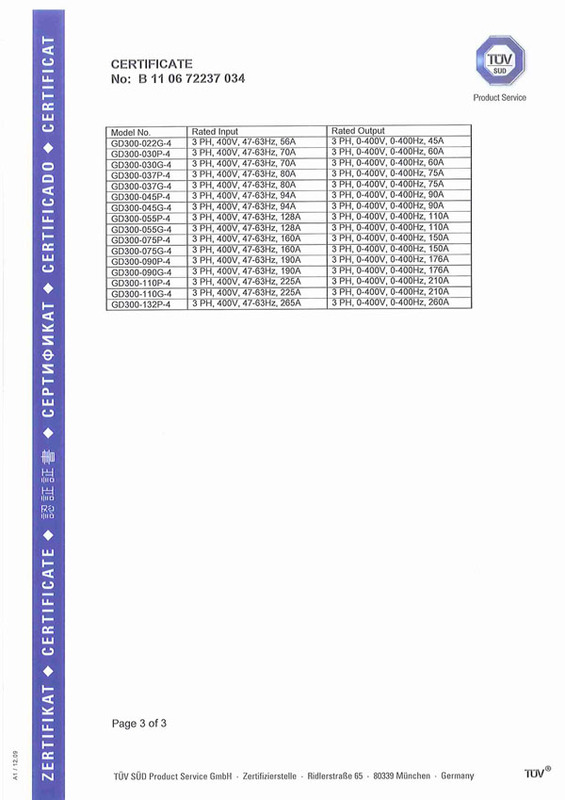 Various expansion cards for communication, high-performance LCD keyboard, filter, auxiliary power supply, braking unit, energy feedback unit, electric reactor, etc. Input filter designed by INVT, which has passed full load EMC test and reaches the highest European EMC standards.